Joe G.N. 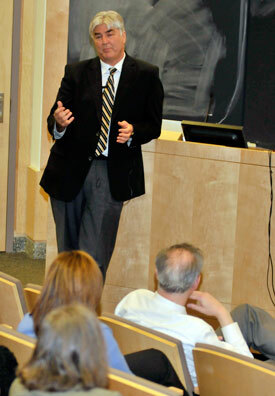 “Skip” Garcia presents his plans for university health care services at a town hall Thursday. Joe G.N. “Skip” Garcia, interim vice president for health affairs and vice chancellor for research, laid out his vision for the future of the university’s statewide health care enterprise Thursday in two sessions to crowded auditoriums on the west campus. “We need an umbrella brand for all the health sciences, the medical center and all our patient care facilities,” Garcia said. • affiliations with other hospitals. The health sciences colleges would retain their names, he said. "Our challenge is how to improve our financial health while improving access to care for our population," Garcia said. The university can achieve one of its core mission  to reduce health disparities  by leveraging its strengths in personalized medicine and groundbreaking research, he said. Bringing personalized medicine to the Medical Center’s underserved and genetically diverse patient population, including African-Americans and Hispanics from different backgrounds, will offer important research opportunities not available to other institutions like Johns Hopkins and Harvard, he said. To take advantage of this diversity, the university must better engage its primary service area, increase awareness of the services it offers and extend its reach into these communities, Garcia said. Enterprise-wide thinking will lead to increased efficiencies and eliminate expensive redundancies, Garcia said. He will identify and nurture “marquee” programs that are academically distinct and can offer the best care in Chicago, he said. The question-and-answer session that followed Garcia’s presentation included a query about how these featured programs will be selected. While the process has begun, it will be some time before the programs are identified, he said.